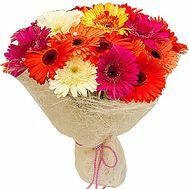 Bouquet of gerberas will be a beautiful gift for the upcoming holiday. The beauty of this flower captures at first sight. It's enough to look at one even a mini-bouquet - and in your soul the coziness and peace will settle, and the day will become joyful and lighter. 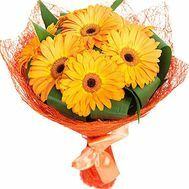 Gerbers are small sunshine in the floral world. Having large and long petals of the most varied shades, they look great both in mono-bouquets and in compositions with them. 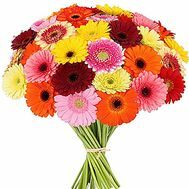 And therefore, if you do not know which flower is best to present to your loved ones - choose a bouquet of gerberas. 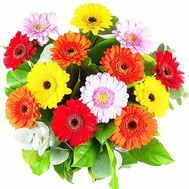 The price for them is moderate, pleasantly will please each buyer and will allow to choose a gift according to its expectations. Do you want to surprise and touch the hearts of people who surround you? 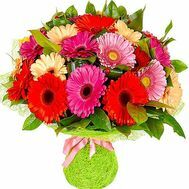 Buy flowers in our store and our couriers will perform accurate delivery to the address anywhere in Ukraine. 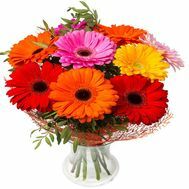 What you need to know before you buy gerbera? It is said that one day the sun came to earth and touched its warm rays of soft soil. 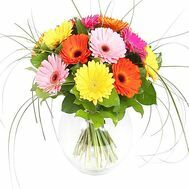 On the spot of this touch grew bright, iridescent flowers, which we now call gerberas. Such a beautiful belief exists in many countries of the world, and it is not surprising. After all, this flower symbolizes joy, happiness, laughter, smiles, and even a healthy spirit. 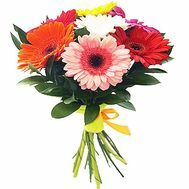 Therefore, it is not surprising that a bouquet from this flower is a welcome guest for holidays or any celebrations. 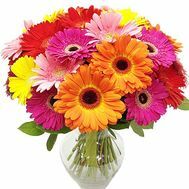 Also gerbera means innocence and modesty, almost chastity. Therefore, it is often chosen as a gift to young girls, to admit to them a strong and strong love. 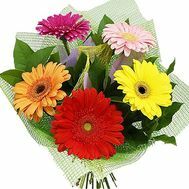 Unusual and elegant, this flower will also perfectly emphasize friendliness and family ties: it is easy to ask for forgiveness or thank you for the important moments for you. 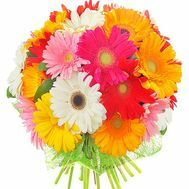 Bouquet of multicolored gerberas: sunny and original, will taste to both young and adult people. 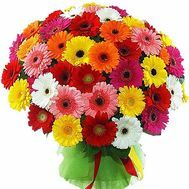 You can order a bouquet of gerberas for various reasons, because this flower has no limitations. 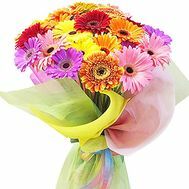 Buy a large bouquet of these flowers can be your favorite teacher on the Day of Knowledge, decorating the gloomy September day with a bright and sunny presentation. 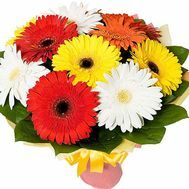 A bouquet of gerberas can also impress and please a little sister for Birthday: large and fluffy heads of this flower will help to emphasize the youth and emotionality of this holiday. 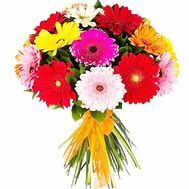 You are in search of an original and beautiful presentation, but do not know what exactly should be presented to friends and relatives? 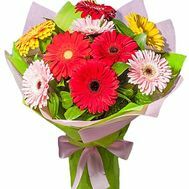 Order a big bouquet of gerberas with delivery, and you are guaranteed to present exactly what will become the most vivid and pleasant memory of this day. 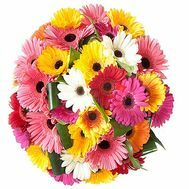 Our online store provides an excellent opportunity to purchase gerberas with delivery throughout Ukraine. 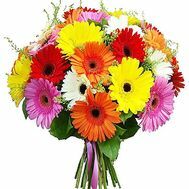 In the case of ordering from us, our delivery service undertakes to deliver the bouquet in the shortest possible time. Thanks to this efficiency, more than 40 000 thousand romantic and simply pleasant moments have already been created. 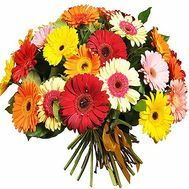 We provide free delivery to major cities of Ukraine, so that the purchase of flowers in our store is even more pleasant. 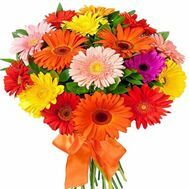 In addition, you will find not only the most democratic prices for flowers, but also pleasant promotions, as well as get a discount for the next purchase. 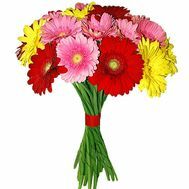 It is here that you can buy gerberas and be sure of their quality, freshness and beauty of the bouquet design. 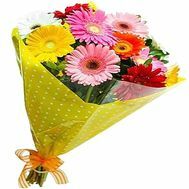 Our florists work tirelessly to meet your expectations, and therefore our range is so big and constantly updated. 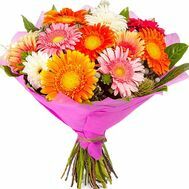 In addition, the delivery of flowers from our store is available to everyone. 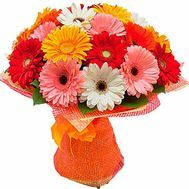 And every customer can count on the fact that his bouquet will be delivered on time. 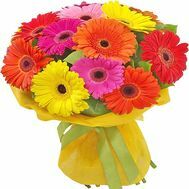 To buy flowers with delivery means to deliver not only a gift, but also happiness in the chosen house!